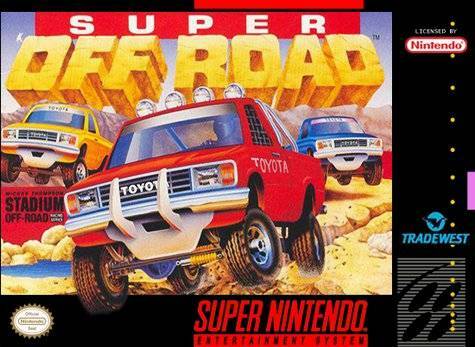 Super Off Road for Super Nintendo allows you to play 16 different Mickey Thompson Stadium Off-Road tracks are full of mud holes, obstacles, and jumps that will test your skill and your truck's suspension! In all, there are 64 possible track configurations, promising that you'll be plenty dirty before you're done playing this game. As you accumulate cash by winning races, you can go to the Speed Shop and upgrade your vehicle in order to improve your chances.